Novomatic does a great job of creating slot machines that have a sense of atmosphere and depth. That’s the case with Wonder World as well. If someone has told us that this game was based on a famous fantasy novel, we wouldn’t have doubted it. Even the way the main character, a female elf, looks at you — knowing, haunting even — hints at something much deeper than a collection of usual sword and sorcery tropes: cowled wizards, magic swords and unicorns. Novomatic Slots themself are fairly straightforward, but in a good way. It features five spinning reels and five bet lines. Three are the standard rows straight across, and the other two span two rows each. You can activate just one or all five lines each spin, and since the small coin size is 1p, you can play with all lines active for as little as 5p. In addition, this game has an RTP of 94.9 percent and a fun, fast playstyle that keeps things interesting even over long sessions. Wonder World is about a place where magic is real and unicorns exist. Elves protect the forests. Humans protect their kingdoms from high castles. Wizards seek out lost grimoires and spy on their enemies with crystal balls. There’s a sword to be found too, and since this sword is worth 10 free games plus a super multiplier, it seems likely that this artifact is the key to our story. We may never know exactly what’s transpiring on Wonder World, and perhaps that’s what helps give the game it’s exceptional atmosphere. Each time the unicorn appears, there is real excitement, and when the elven woman and old sorcerer are on the screen together, the online slot suggests a relationship that has been unfolding for many years and with much hanging in the balance. Standard symbols pay out on bet lines from left to right, and you can win multiple lines in a single spin. 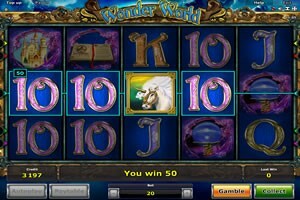 The unicorn serves double duty as both the jackpot symbol, which pays out 20,000 coins, and the wild symbol, which can substitute for any other symbol except the scatter and bonus symbol. 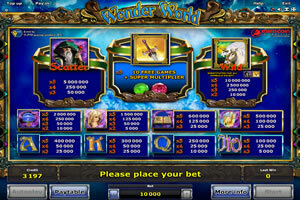 The scatter pays out with three or more anywhere on the board and pays out 10,000 coins at five symbols. The bonus game kicks in whenever three or more bonus symbols hit. The bonus games award you 10 free spins and applies either a x2 or x3 multiplier to all wins earned during those free games. Each time you win, you have the opportunity to gamble a portion of your winnings on a hi-lo bet. 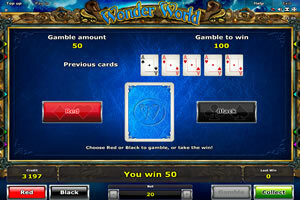 The aesthetic style of Wonder World stands out and makes the game interesting to play. The attention to detail in the symbols help to set the stage, and the music and sound effects sell the atmosphere. It’s just a really fun game to play with a lot going on without being overly complex. The RTP is solid, you don’t have to be a high roller to enjoy it and the free spin mode fires off at a reasonable rate. In addition, the bonus symbol stays active during free spins, so you can just keep stacking them if you get on a run. This is a game you’ll remember and come back to time and again.